The last day of the Congress (October 4) special tours are arranged to take congress participants to outstanding landmarks of ceramic interest. Please note: If a certain route does not reach 30 participants, the route will be canceled. Participant will have to choose from the remaining routes. The Water-Moon Dharma Center at the Dharma Drum Mountain Nung Chan Monastery in Beitou was built in the modern minimalist architectural style. 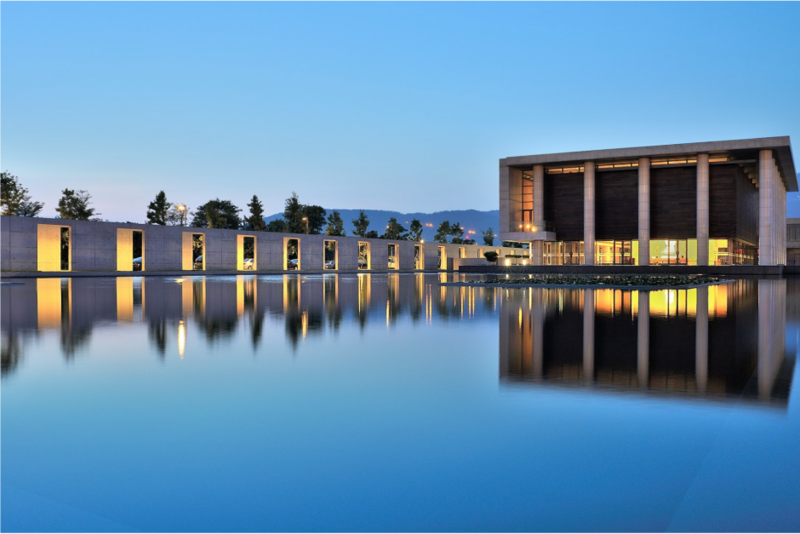 It’s a popular place with tourists, featuring an attractive, mirrorlike pool in front of the grand hall, reflecting clouds, sky, and the pavilion behind. 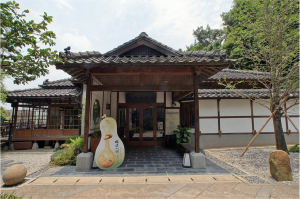 The Taiwan Folk Arts Museum is located in a Japanese occupation era building formerly used as the upscale Koyama Hotel and hot spring. Designated as a Taipei historic site, the two-floor wooden structure covers an area of about 2,645 square meters. The Japanese-style courtyard is elegantly landscaped, with a small bridge, stream, artificial mountain and pine trees. The building is especially evident beautiful illuminated at night. During World War II, the building was used as a Japanese officers’ club. After the war, it was used as an official guesthouse and later it was sold to a private buyer. The building also has been featured in many local movies. The museum exhibits include a permanent display on the history of the museum building as well as various theme exhibits. The displays provide a cultural complement to the seasonal natural beauty of the museum setting. 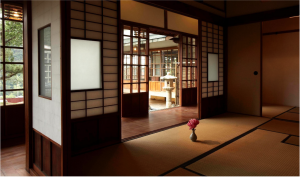 On the second floor, visitors can also enjoy Japanese tea ceremony demonstrations and other artistic performances. The space can also be rented for dinner banquets. 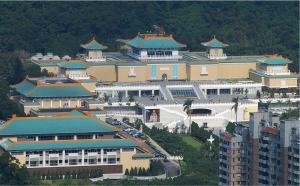 National Palace Museum collects about 620,000 Chinese treasures, covering 5,000-year historical development from the Neolithic Age to Chin Dynasty, and is one of the first four museums in the world. In the three-story exhibition halls, the exhibits are classified on the basis of themes, such as Bronze, Pottery & Porcelain, Paintings, Carvings and Jade. 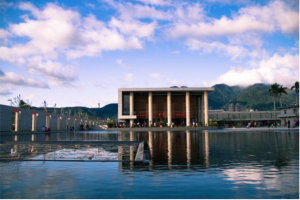 Located in the Gold ecological Park, New Taipei City (Taipei County)’s Jinguashi, Jiufen, the Museum of Gold was opened during year 2004 as one of the first museum planned as an eco-museum in the island. The aim is to combine community power and preserve the precious natural resources, mining relics, landscape, historical memories and cultural property of Jinguashi. 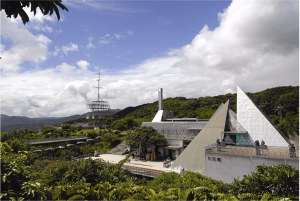 In 2002, Jinguashi was named a potential world heritage site. 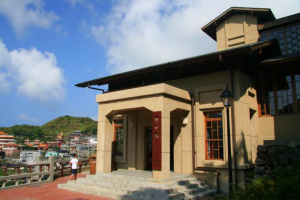 Located in New Taipei City (Taipei County), Chiufen village used to be the center of gold mining. This small village is located within hills, next to the mountains, and facing the ocean. 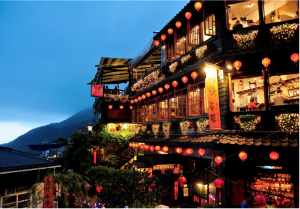 Due to its special location, Chiufen village is well known for its foggy weather condition which creates a romantic atmosphere. The name Chiufen comes from a legend where nine families used to live in this village. Before the development of Chiufen, there was a lack of transportation which made trips to the market inconvenient. Therefore, whenever one family goes grocery shopping at the market, they would be divided what they have bought into nine pieces for each of the families. “Chiufen” literally means “nine pieces” in Mandarin, and this is how the village name came from. Ju Ming, originally named Ju Chuan-Tai, is an internationally renowned master sculptor. In the beginning, this was not a museum, but rather a storage space for his large sculptures. Inspired by the natural surroundings of Jinshan, Ju Ming decided this would be an ideal setting for an art park. Juming Museum doesn’t just display his unique works of art, but also serves as a venue for the cultivation of artists’ creativity. 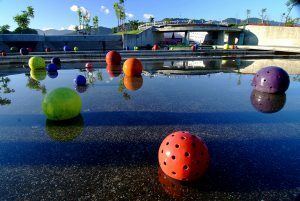 The museum occupies a total of 11 hectares, and its outdoor exhibition space is divided into Taichi Plaza, Human World Square and Sport Square. Juming’s work in the museum can be ascribed to several series: the Nativist Series, Taichi Series, and Living World Series. Each series reflects the core values of the master’s attitude toward his life and his art. 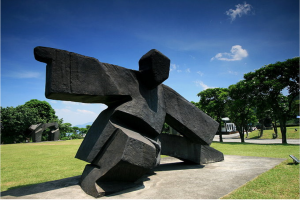 Those sculptures of his Taichi series displayed in the Taichi Plaza are regarded as the best and the most famous of his work. The building of the museum is like a pyramid, a work of art in itself, displaying his indoor pieces of woodcarving and pottery as well as works by his mentors.